JUPITER is designed as entry-level fermenter for easy control by beginners and experienced user alike. It is therefore ideal for educational purposes. JUPITER meets your specific needs, it covers a wide range of applications and complies with the requirements of a validated GMP regulation. The control cabinet includes all the functions for parameters measurement and control: intelligent sensors, wireless connection, easy load pumps and aeration module conveniently located. It is designed for greater performance at a lower operating cost for your lab. 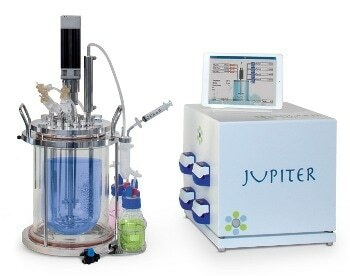 JUPITER is an ideal partner for microbial fermentation as well as animal, plant and insect cell cultivation.